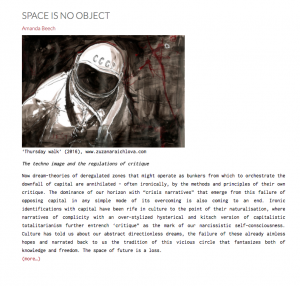 Space is No Object, The techno image and the regulations of critique. Amanda Beech, Kai Bosworth, Ben Bratton, Kathryn Denning, Elizabeth Ellsworth, Carla Leitao, Geoff Manaugh, Rory Rowan, Keith Tilford, Kazys Varnelis, Evan Calder Williams, and MacKenzie Wark. This essay was first delivered as a paper at the conference Post-Planetary Capitalism, organized by Ed Keller, Center for Transformative Media, New School New York,March 24th 2014. In 2016 the text was published in longer form in the anthology Re-Inventing Horizons. Now dream-theories of deregulated zones that might operate as bunkers from which to orchestrate the downfall of capital are annihilated – often ironically, by the methods and principles of their own critique. The dominance of our horizon with “crisis narratives” that emerge from this failure of opposing capital in any simple mode of its overcoming is also coming to an end. Ironic identifications with capital have been rife in culture to the point of their naturalization, where narratives of complicity with an over-stylized hysterical and kitsch version of capitalistic totalitarianism further entrench ‘critique” as the mark of our narcissistic self-consciousness. Culture has told us about our abstract directionless dreams, the failure of these already aimless hopes and narrated back to us the tradition of this vicious circle that fantasizes both of knowledge and freedom. The space of future is a loss.